Precise and safe radiation therapy breast cancer in Israel. International patients. Medical care in Israel > Radiosurgery > More accurately and safely: progress in radiotherapy for patients with breast cancer in Israel. More accurately and safely: progress in radiotherapy for patients with breast cancer in Israel. More targeted projection devices with built-in optical systems to better match the unique anatomy of each patient, allow women with breast cancer to receive more accurate, safe and rapid treatment. An intensifier of breast cancer and a new linear accelerator makes cancer treatment easier. Thanks to this, Israeli researchers managed to turn breast cancer cells into healthy ones. For women with breast cancer radiation therapy is one of the most important parts of the process. These are complex procedures that are prescribed to our patients for a period of 3-6 weeks. Fortunately, Israeli medicine is constantly moving forward and is looking for new ways to fight cancer. This also applies to radiation therapy. The department of oncology at the Assuta Hospital last month established the world’s most advanced accelerator, which allows our patients to receive radiation therapy with a greater accuracy of the radiation dose. “The new accelerator has a particularly important advantage in the treatment of women with breast cancer,” said Dr. Raphael Pfeffer, senior oncologist and head of the Oncology department of Assuta. According to him, the new accelerator allows specialists to more accurately adjust the dose for women with different body structures and makes it easier to solve the problem of adjusting the treatment area in real time. This accuracy is especially important when irradiating the left breast, located close to the heart. The amplifier contains a component that tracks the shape of the body, processed automatically, which allows more effective treatment of breast cancer. 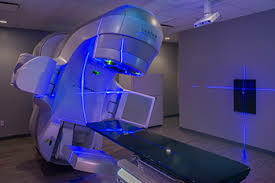 Dr. Pfeffer also added that along with the treatment of patients with breast cancer, the accelerator can also be used to treat limb tumors and targeted treatment. The same treatment is a simpler method. “Treatment in itself does not differ from radiotherapy, but the method that it uses is easier for patients and more accurate for treatment, and is also more convenient for medical personnel,” says Dr. Jonina Tova, Head of breast radiotherapy at the Oncology Institute of Assuta. “The new accelerator has increased the importance of removing radiation from the heart in the treatment of breast cancer, and now we have an advantage over the disease in case of breast cancer, because by obtaining precise characteristics of the organs, we can specify the exact radiation angle, without penetrating radiation into healthy tissues of the body . If necessary, in order to protect the heart from radiation, we ask the patient to breathe deeply to as much as possible to detach the heart from the ribs, and give us a greater range of motion without risk of irradiating the heart”. The doctor also added that the new accelerator provides a way to more effectively monitor the movement of the chest. Dr. Tova also said that more modern methods today allow shortening of treatment cycles, which will help to return to normal life more quickly. Another advance in the treatment of breast cancer, offered by the Assuta, is one-time radiotherapy, which is performed during the operation. This option is suitable for a certain category of women. Such irradiation can be given during lymphomectomy surgery, partial mastectomy, and this process replaces the need for standard daily radiotherapy. The main difference between the breast cancer intensifier is the ease of use. Dr. Daphne Levin, senior physicist-radiologist at Assuta, explains: “The new Varian TrueBeam accelerator includes an update of the visualization tools that are installed on it. The new system allows technicians to perform treatment faster and more accurately. However, she stressed, the quality of medical care in previous accelerators was also excellent. “The main difference is the usability of the accelerator, which allows us to optimize the treatment itself and medical care,” says Dr. Levin. All procedures in the oncological department of Assuta Clinic, including chemotherapy, biological methods of treatment and modern immunotherapy, are provided within the framework of state medicine and according to the standards of the Ministry of Health of Israel. The Institute is at the forefront of technology, has passed the international accreditation process and is recognized as an international center of excellence.